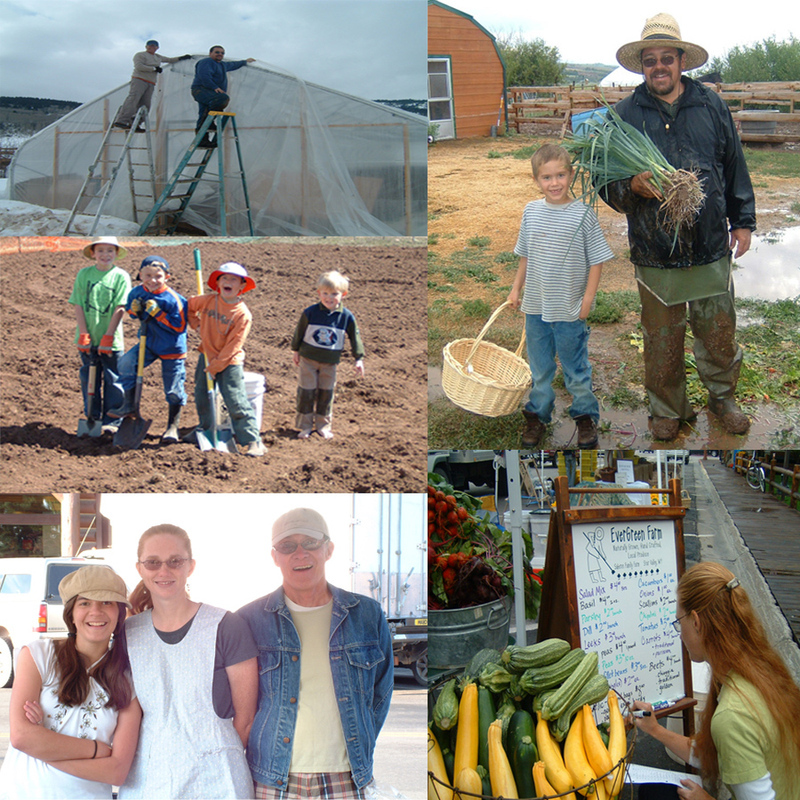 Thank you for a wonderful 2007 farm season! As the end of this farming season falls upon us (along with the snow), I have spent much time reflecting and considering a question I am always asked "Are you glad it's over?" No, I'm not "glad". But I am looking forward to spending some time on new projects, cleaning the house, fixing that leaking sink, baking bread again, volunteering in my son's classroom, and maybe even sleeping in a few times. I've had a song on my mind the past few days which sums up the way I feel about farming. (Let me first confess to you that I like a wide variety of music which I often sing out loud to annoy my husband and embarrass my children.) The song is from the 1970's, "Thank you for the Music" by ABBA. Now you are either 1) laughing, 2) have no clue what I'm talking about, or 3) recalling the lyrics to yourself and wondering how in the world I can relate this song to farming. Without this way of life, what are we? There it is folks. That's how I feel these past few days. Cheesy, but true! 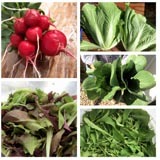 THIS IS YOUR LAST CSA FOOD DELIVERY FOR THE YEAR! 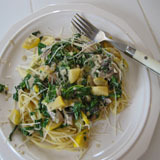 The garlic you are getting this week is the leftovers from what we put aside to plant. It is a little beat up, but it tastes just as good as the "pretty" garlic we sell. Please continue to check back to the website for more farm updates and information on joining the CSA next year. I will also be sending out an email notice as we get more organized. This past weekend our family took a little "vacation" and drove to Montana to pick up a new addition to the farm. This is Duke. 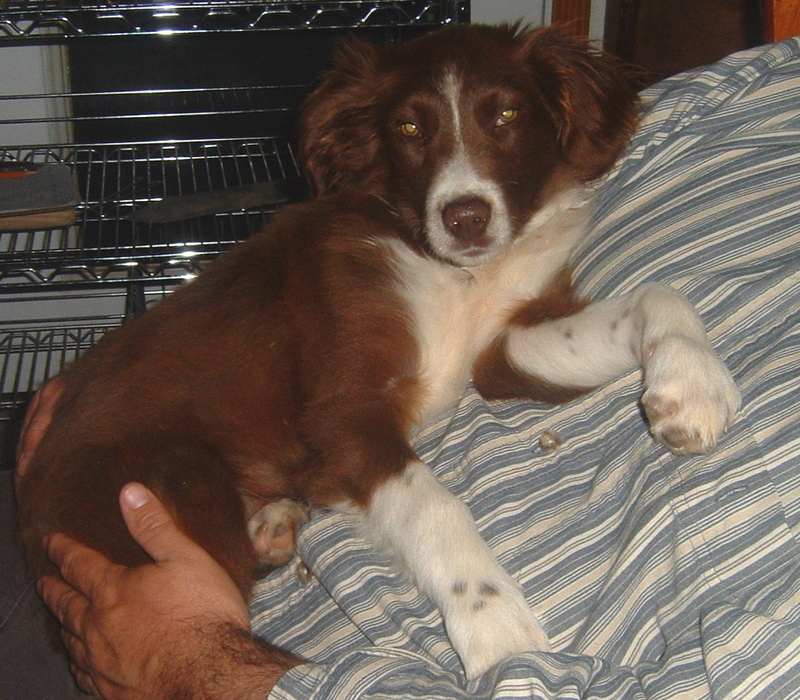 He is an English Shepherd. He will have jobs to do here on the farm, but for now he is taking it easy. We finally pulled up the last of the yellow onions. I recommend you make something yummy, like French Onion Soup. Next week will be our last week for the CSA. I have bitter/sweet feelings about the end of the season. I'm getting tired and the weather is turning cold, but I sure will miss seeing the good people associated with this farm each week. Thank you for your support. 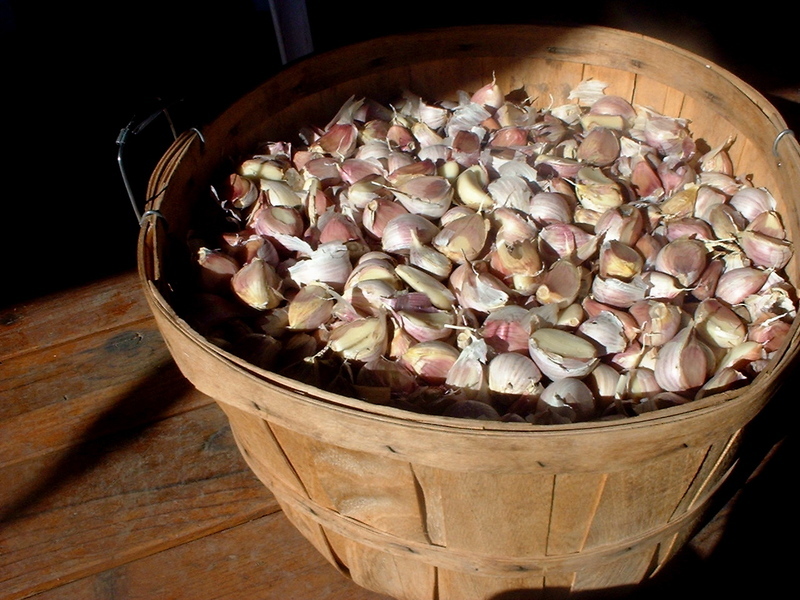 Above is a photo of a bushel of separated garlic. Over the past week, we planted approximately 6 of these big baskets out field #1. Each clove of garlic, one at a time, for a total of twenty five 150' rows. Whew! I'm so happy that this job is done that I don't even feel like complaining about the few inches of snow we received on Saturday and Sunday. But I do have to mention it only to give you a good reason why your vegetable share is a little less than I'd like this week. It went a little like this: Friday - planted most of the day, Saturday - planted until about noon when the snow really started coming down and the temperatures dropped, Sunday - snow and lots of mud, Monday - the snow was all melted but the ground was way too muddy to plant, Tuesday - we got the last 9 rows and MISSION ACCOMPLISHED! Thank you so much to those who came to help. This is a big job and we are so very appreciative of your effort and hard work. And an extra big THANKS goes to Cal. Here is the man of the week! 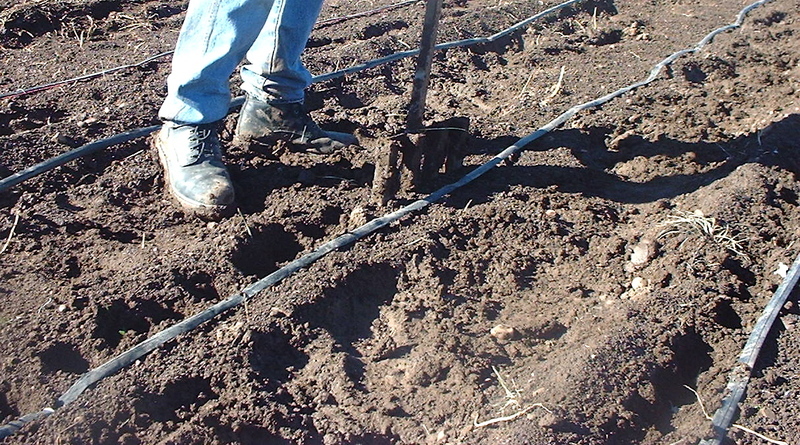 He came up with an idea and then built a tool to speed up our planting process. Here is the tool that he welded together, with thick metal "prongs" at the correct spacing and depth, to make the holes we plant the garlic cloves in. Cal would go up and down the rows, making holes next to the previously laid out drip tape, and then we'd come along and put in the garlic. I've got ideas already for next year when we go to transplant the onions and leeks. This week your share will include: I'm not entirely sure just yet. Like I mentioned above, we didn't get the garlic done until Tuesday, which took out a full day of harvesting for the CSA. Sorry folks. So far, we've got the carrots, potatoes and a nice variety of peppers ready. I'm hoping tomorrow to get you another large bag of tomatoes, leeks, and either scallions or onions (two out of three ain't bad). This all depends on how many workers are able to come help. As for a farm update: The tomatoes haven't died off just yet, but they are showing signs of stress from the cold temperatures we've been having at night. The peppers still look good and are finally starting to change colors. The salad? The new rows Shain planted about a month ago are growing, but the greens are still very small. Maybe next week. Carrots, beets and other things growing underground are patiently waiting for us to dig them up for you next week. Otherwise, it is starting to be clean up time on the farm. Lots of work to get the fields cleaned up and composted for the cycle to start all over next spring. Almost forgot, I put another great soup recipe on the blog this week. It is called Steak Soup. It is fabulous! A new favorite of mine. It's that time of the year when the rate of the growth for the crops has really slowed down, due to shorter days, cooler temperatures, and lower light levels. Each year Shain anticipates this reality and plants accordingly earlier in the season to ensure a continued harvest through October. He is always thinking ahead. This is the East side of field #1, which was previously home to 150' rows of peas, salad, kale, zucchini and squash. 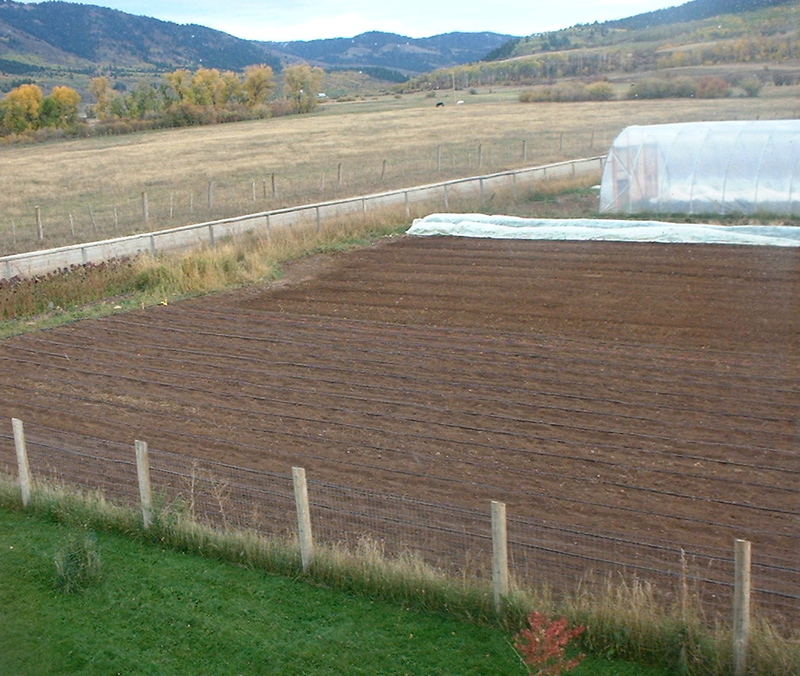 Most of it is cleared out now and spread over with a new layer of compost to make room for a fall planting of garlic. 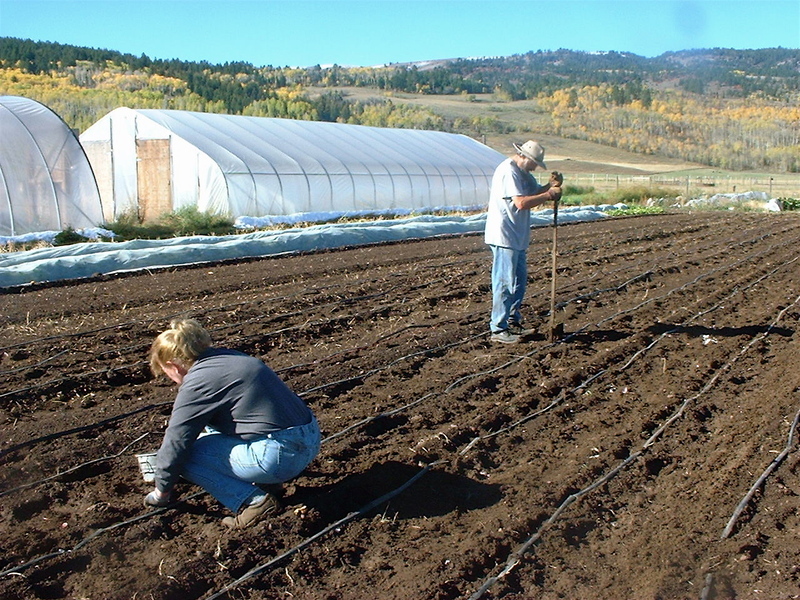 Each year we swear there must be an easier way of doing this, but I usually revert back to the basics of crawling down the rows on my knees, pushing each individual clove 2 inches down into the soil at 4 inch intervals, and then tucking the dirt back down around it. By the time this coming weekend is over we will have planted about 10,000 garlic cloves for next year's harvest. Peppers - a variety of all the types we are growing. We've been hoping the peppers would have change colors by now, but it hasn't happened yet so you are getting them a little less mature which usually just means less heat. We have experienced some very cold nights over the past week, with temperatures dipping down into the 20's. On nights like these, we do whatever we can to help pull the tomatoes and peppers through. The peppers are now getting 3 or 4 layers of row covers each night and there is a heater out in the greenhouse with the tomatoes. But with these cold nights, it is touch and go. We can only do so much and then Mother Nature decides the rest. My job is to not get to upset about it. Hope you are enjoying the onions. This has been an incredible year for onions, our best ever. Sorry if you can't keep up with the quantity we are sending out each week. Spread the "love" around a little with your neighbors.